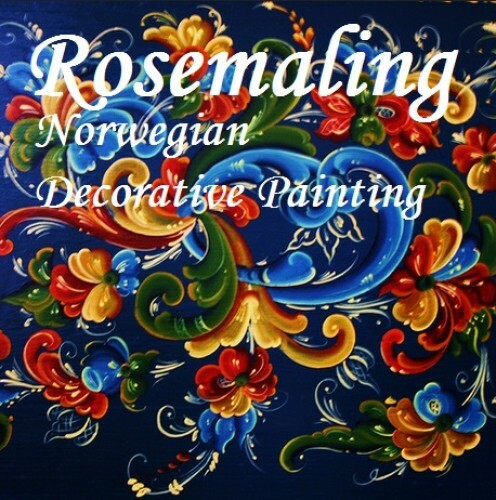 Rosemaling (Norwegian rose painting) is the name of a form of decorative flower painting that originated in the low-land areas of eastern Norway around 1750, when Baroque, Rengeny and Rococo, artistic styles of the upper class, were introduced into Norway’s rural culture. Rosemaling designs use C and S strokes and feature scroll and flowing lines, floral designs, and subtle colors. Script lettering, scenes and figures may also be included. Artists who specialized in rosemaling came from poorer classes in the countryside, rather than the land owners. They would travel from county to county painting churches and/or the homes of the wealthy for a commission of either money or merely room and board. Thus rosemaling was carried over the mountains and toward Norway’s western coast. Once farther away from the influence of the painters’ guilds, these artists tried new ideas and motifs. Rosemaling became widespread as amateur artists in rural areas often imitated this folk art. Soon strong regional styles developed and today the three main styles are Telemark, Hallingdal and Rogaland, named after the region of Norway in which each originated. 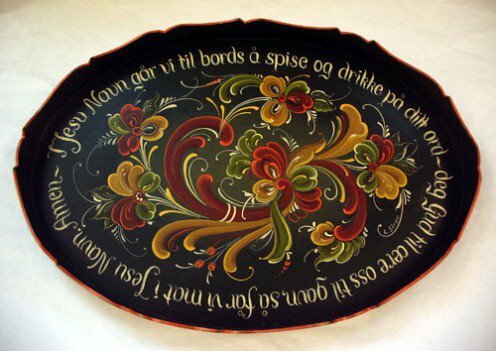 Norwegian Immigrants brought the art of rosemaling to the United States, and many of the immigrants came from parts of Norway where rosemaling was well established. 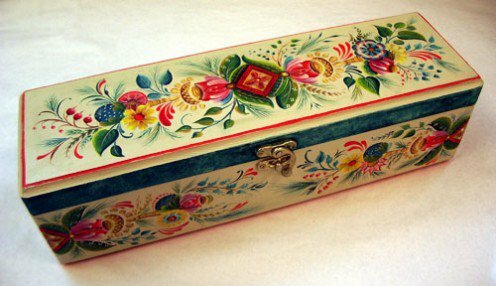 They carried their belongings in beautifully rosemaled trunks, Some of the immigrants were Rosemaling painters. 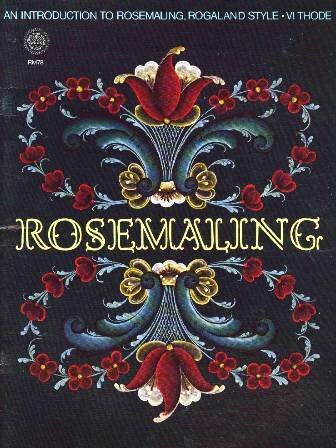 This generation, however, contributed little to the development of American rosemaling in the 20th century, because rosemaling began to go out of style starting in 1860. 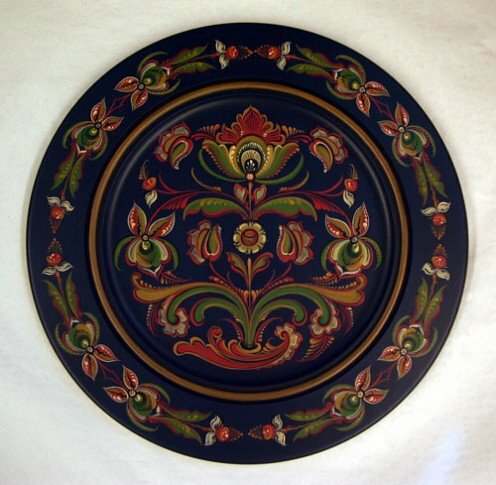 Rosemaling experienced its revival in America in the 20th century. 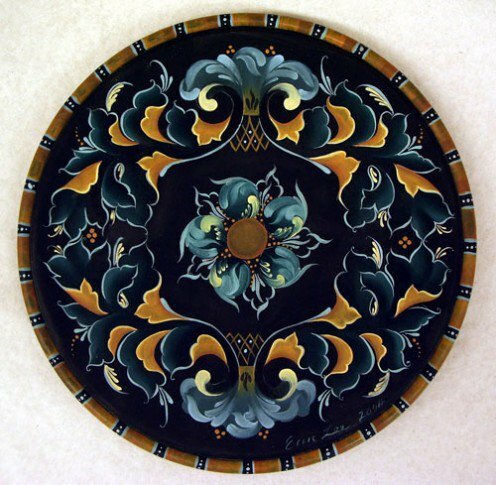 Norwegian-Americans became interested in the rosemaling decorated possessions of their ancestors. 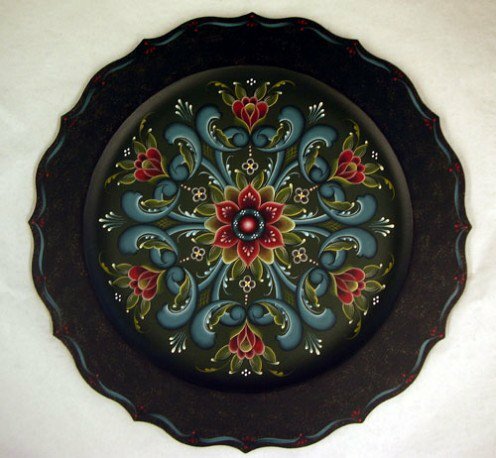 American rosemaling began to develop and flourish. The revival of Rosemaling in the United States is often credited to Per Lysne who was born and trained in Rosemaling in Norway. He came to America in the early 20th Century and was employed as a wagon painter in Stoughton, Wisconsin. When business slowed during the Depression he began to rosemal again. Others imitated his work. 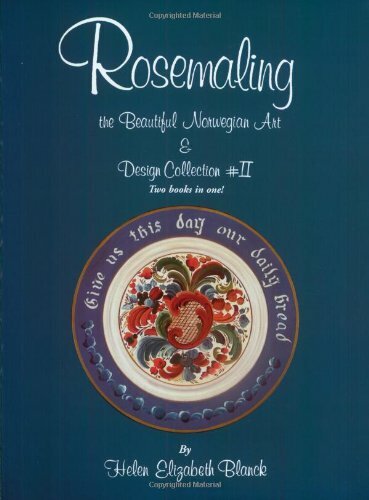 Today Norwegian rosemaling is taught in many areas of the USA. 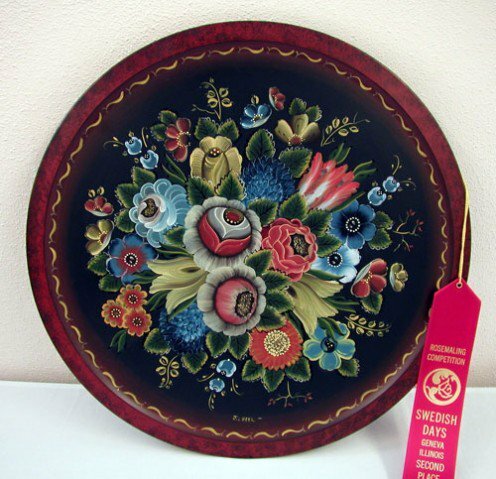 Rosemaling associations sponsor classes and competitions. Traditional decorative arts meet contemporary living in the Scandinavian interiors of Sigmund Aarseth. 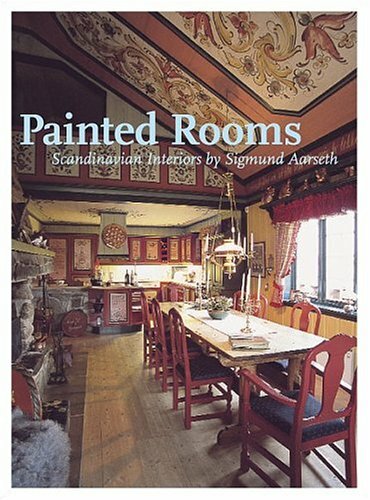 ‘Painted Rooms’ presents an impressive variety of beautifully painted interiors, from colorful traditional Norwegian farmhouses to exciting commercial interiors. The book shows the innovation, experimentation and individuality which has always been an important part of the Norwegian psyche. It also documents a renewed demand for colorful, decorated rooms in Norway. 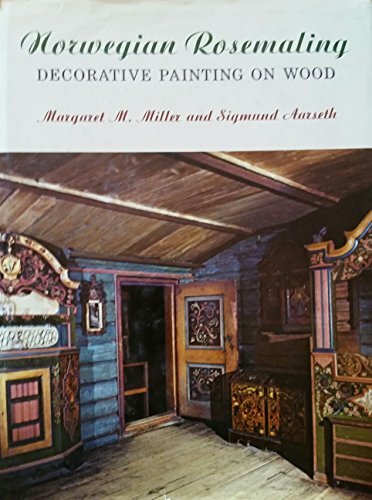 The broad range of styles and techniques featured in this book makes it a valuable resource for anyone with an interest in interiors, decorative arts or Scandinavian lifestyles and traditions. It is also an indispensable reference book for decorative artists, interior designers and crafts people of any discipline. Contains more than 200 color photographs by Gudmund Aarseth. How-to-paint book of Norwegian Rosemaling (Decorative Painting) on twenty-two wooden boxes of traditional and usual shapes. Each box is painted using easily available colors and has designs included with complete instructions. Beautiful colors photos of each box are included. Boxes range from small and easy to paint to larger and more complex pieces. Traditional Norwegian pieces include Norwegian Bible boxes, tines (lunch boxes), recipe boxes and salt boxes. Some boxes are chip carved. There is complete source information included and supply lists. All pieces and supplies can also be ordered from the author. Many of the boxes are available from local craft shops and are inexpensive. 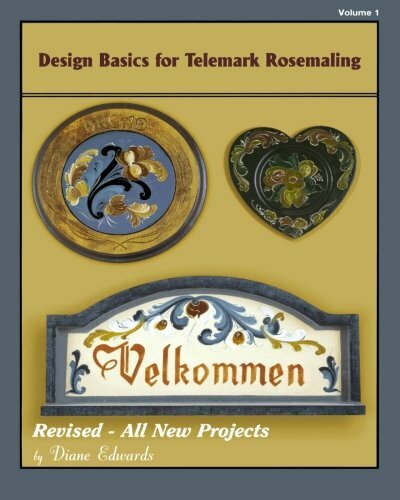 Other books by the author include: Rosemaling Strokes, Volume I (for absolute beginners in the art) , Design Basics for Telemark Rosemaling Volume II (information on painting on many different surfaces) and Design Basics for Swedish Folk Art. Baroque scrolls and acanthus leaves wrap around a central flower. The designs are symmetrical, using opaque color and not generally shaded. Backgrounds are red, black-green, dark green, and a lighter blue-green. Flowers are grouped in a bouquet or garland, gathered in an urn or hanging from a rope. Realistic flowers can be identified and given a name. Leaves are slender, long, s-shapes with a second s turning it at the end. Flowers grow from blue landscapes. In Rogaland, flowers are more important than scrolls and leaves. Tulips, stylized roses, 4 and 6-petal flowers, and the daisy pull-out are used. Designs are symmetrical. Opaque colors on dark backgrounds, and the use of cross-hatching, dots and teardrops characterize Rogaland. Typically backgrounds are white or red. Designs include geometric shapes such as cubes and squares, and architectural motifs such as churches or fine houses. Flowers, both symmetrical and asymmetrical are grouped on stems. Heavy line detail on leaves. Transparent, bright colors,and saw-toothed borders are used. Gudbrandsdal style is an imitation of carving. Acanthus scrolls and leaves predominate in a C with an S extension. Shading gives leaves a 3-dimmensional look. The flowers used are tulips and 6 or 8-petal roses that center in the C and, again, in the S above. Often symmetrical. Symmetrical and somewhat geometric. Typified by light colors on a dark background, teardrops by the dozen along the leaves and scrolls. Opaque colors, not shaded, and with red, black and white overlays are typically used. Oval flowers are split down the middle with contrasting colors. 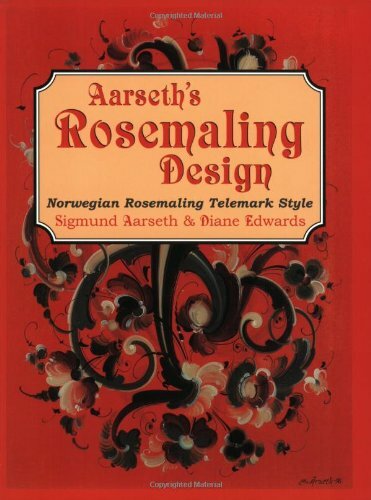 Norwegian Rosemaling that is simplified to make sense for younger people. 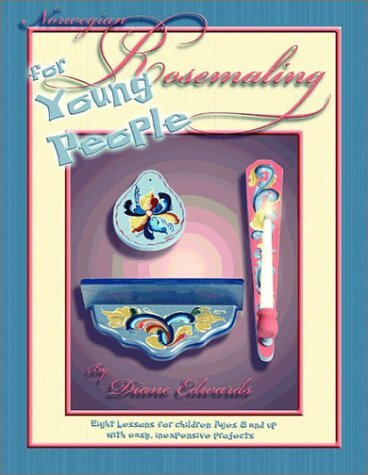 Painting and decorating many simple pieces available from the local craft store, Diane Edwards has created a book that helps children or absolute beginners to understand the craft of Norwegian Rosemaling. There are many color pages of strokes, colors and projects that can be done individually or in a camp or club situation. She uses simple glass pieces and ornaments and breaks down the decoration into single stroke approaches. 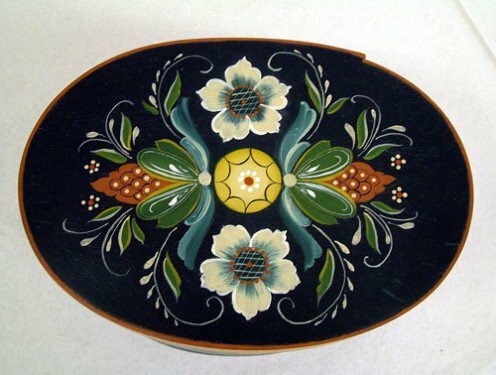 There is also a history of Rosemaling and information about finishing old and new pieces of woodenware. 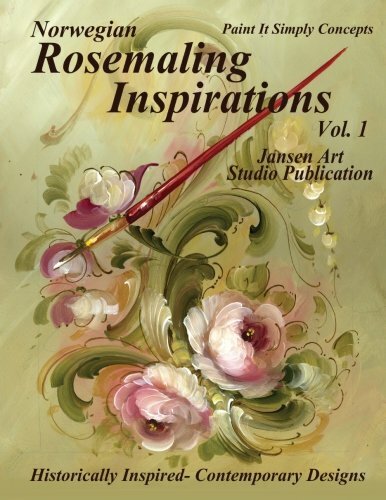 An excellent book for someone who wants to try Rosemaling without a lot of work or expense. 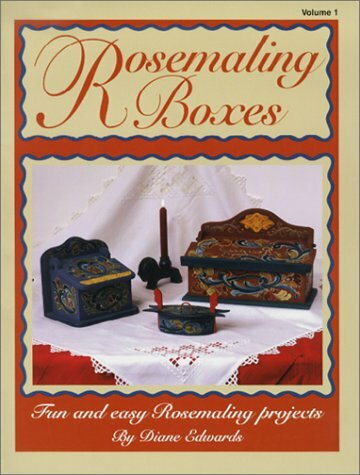 Rosemaling is a traditional form of cultural expression often handed down in families. Do you know of a cultural tradition that has been handed down in your culture similar to this one? Or maybe not an art type tradition but a recipe or holiday tradition? Follow Paula Atwell's board Lake Erie Artists Gallery Cleveland Ohio¤ on Pinterest.